That simple statement summed up what is now referred to by author Elliot West as The Last Indian War. West is referring to the war against the Nez Perce of what is now Idaho in 1877. The statement could be equally applied to any Indian tribe in North or South America. What makes the Nez Perce story unique is the remarkable journey that about 800 Nez Perce made in their flight from Idaho to within 50 miles of the Canadian border in 1877 fighting against the US Army (and usually winning) all the way! To give some perspective their journey took them over 1500 miles all the while being pursued by the US Army. The word “epic” is over used today by their journey was truly epic. The map illustrates the epic journey of the Nez Perce. Although I was familiar with the Nez Perce War I was reminded in August of this year as my wife and I visited Yellowstone National Park. The Nez Perce trail is right outside of the park and as you can see from the map the Nez Perce traveled through the park itself. West tells the Nez Perce remarkable story with great detail which never bogs down the narrative but rather enlivens the narrative to give greater insight to the Nez Perce culture and the events leading up to the war. From the time of Lewis and Clark to the out break of the war in 1877 the Nez Perce had always sought peace with the whites even when the whites changed the rules and cheated them. (West gets into the clash of civilizations and the prevailing white attitudes that the Indians had to change their traditional way(and become Christians) or they would become extinct. West also takes apart some myths especially in regards to Chief Joseph the fascinating leader of the band of Nez Perce that fought their way nearly to Canada. While Joseph was certainly a brave warrior and at one point saves the vital pony herd he was not the military genius he still is thought of today. West points out (with detailed documentation) that the Nez Perce like other Indians were led moment by moment (especially in battle) by men of influence and war experience. This meant depending on the circumstances that one leader could lead one day only to be replaced the next day by another leader if the first leader failed in some way or circumstances changed to favor the second leader. Indian warriors were highly individualistic in combat and would usually gather around an experienced warrior and pretty much do what they wanted. This was in contrast to the pursuing US Army whose soldiers were under orders, army discipline and authority within a defined command structure. No such structure existed among the Nez Perce or other Plains Indians. Warriors like Yellow Wolf, Ollokut ( Joseph’s brother) and Looking Glass (and many others) seem to have had intrinsic tactical sense as they fought amazing rear guard actions that protected their young, wives and infirm as well as a vast pony herd that they needed to escape. The point is these actions were not controlled by a “Napoleon” like figure but rather by remarkable warriors doing remarkable things without a Napoleon like figure to tell them what to do! 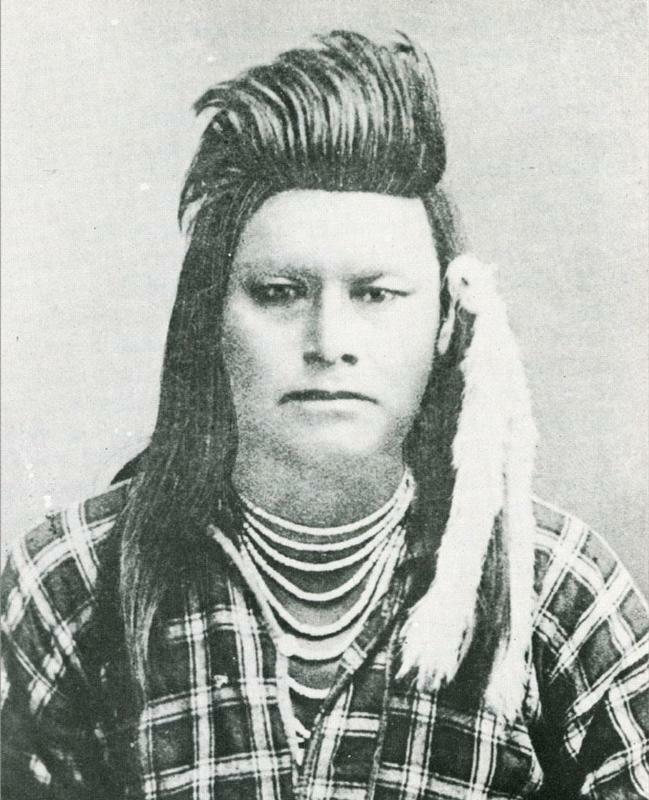 OllikutYounger brother of Chief Joseph, Ollikot was a great warrior, killed at Bear Paw. The fact is the Nez Perce embarrassed the US Army time and time again. After the disaster on the Little Big Horn in June 1876 the army needed to find a Sitting Bull or Crazy Horse like figure with Napoleonic qualities of extraordinary skill to explain their losses and frustration with an enemy that always seemed one step ahead even when surprised. Oliver Howard the unlucky and sometimes incompetent pursuer of the Nez Perce. Howard lost an arm in the American Civil War and was the unlucky general at Chancellorsville when General “Stonewall” Jackson outflanked the Union Army in a stunning victory. Howard also commanded the 11th Corps at Gettysburg and was (unfairly) blamed for the rout of his Corps. Chief Joseph was more the diplomat than military genius. While Joseph and his band wanted to be left alone on their own land he and they resisted the idea of war even as whites continued to steal their land and change the rules. Joseph only joined the war when some young men of his tribe reacted to the murder of one of their friends and in turn murdered some whites. The fact is the Nez Perce had been lied to repeatedly and government promises were never met. The frustration among the young men grew and grew until they lashed out at those exploiting them. All that and more is documented in The Last Indian War. Another area of some debate is what Joseph actually said to Colonel Nelson Miles when the band eventually surrendered after being hopelessly surrounded and losing their pony herd just short of the Canadian border. Joseph is widely noted for saying, “From where the sun now stands, I will fight no more forever” and he probably did say that or something close to it. However, Joseph did not speak English and the surrender was negotiated with two Nez Perce interpreters (who did not go to war) and one white interpreter. Whatever he said had to go through three interpreters and that’s problematic. The surrender was witnessed by a number of Army officers, one of whom became a well-known writer/poet as well as an admirer of the American Indians and of the Nez Perce in particular. This writer may have embellished the “fight no more forever” speech reproduced below. I am tired of fighting. Our chiefs are dead; He who led the young men my brother, Alikut is dead. It is the young men who say yes or no. It is cold, and we have no blankets; the little children are freezing to death. My people, some of them, have run away to the hills, and have no blankets, no food. No one knows where they are, perhaps freezing to death. I want to have time to look for my children, and see how many of them I can find. Maybe I shall find them among the dead. Hear me, my chiefs! I am tired; my heart is sick and sad. From where the sun now stands, I will fight no more forever. Book cover are from the The Last Indian War by Elliot West. To some extent it doesn’t matter whether Joseph actually said all that at the surrender or not for it certainly must have summed up exactly how he felt. The book is divided into three main parts. Part I deals with the prewar situation starting with the Lewis and Clark expedition that first made contact with the Nez Perce in 1805 and ending just before the start of the war in 1877. Part II deals with the war itself. Part III deals with the surrender, the Nez Perce removal to Indian Territory in Oklahoma (an ordeal in an of itself) and their partial return to Idaho (although not to their original land). The book was hard to put down and for this reason I give it 5 stars.